The project aims to provide additional access to the region from northbound I-35W to 28th and southbound I-35W to Lake Street. The Minnesota Department of Transportation's (MnDOT) $239 million, multi-year 35W@94: Downtown to Crosstown project reached its first year of construction in July as crews from a joint-venture, consisting of Ames Construction, Lunda Contracting Co. and Shafer Contracting Co., are looking to deliver the project in the fall of 2021. The work will see the reconstruction of 2.5 mi. of I-35 between 43rd Street and 15th Street in Minneapolis, along with 22 bridges. Another goal of the project is to provide motorists a congestion-free travel option into and out of downtown Minneapolis by converting the northbound I-35W shoulder lane between 43rd and 26th streets to a MnPASS Express Lane; establishing an MnPASS Express Lane on southbound I-35W between 43rd and 26th streets; improving public transit service via an online transit station on I-35W located at Lake Street, which will be a primary hub for the Orange Line and provide a safe and efficient transit connection; improving pedestrian and bicycle access and travel options on local streets; providing better access into the Lake Street Business District; and improving accessibility, safety and mobility for motorists. Key aspects of the work include: improving access from I-35W to the Lake Street Business District by constructing two new exit ramps (NB I-35W to 28th Street and SB I-35W to Lake Street); upgrading accessibility by improving pedestrian accommodations with pedestrian curb ramps and sidewalk upgrades; rehabilitating pavement and bridges on I-35W from 46th Street to 11th Avenue, Hwy 65 from 26th Street to 15th Street and I-94 from Nicollet Avenue to Park Avenue; and constructing new and rehabilitating existing noise barriers throughout the project limits. This section of road was constructed in 1967. MnDOT made routine repairs to the pavement in 1985 and in 1995, and in 2009, the priced dynamic lanes were developed to improve the flow of traffic and to relieve congestion in the corridor. The road is heavily used by Minneapolis residents. In 2013, 198,500 cars and trucks used I-35W per day, and in 2028, traffic is projected to increase to 257,700 vehicles per day. I-94 in 2013 had 243,000 vehicles per day, and traffic in 2038 is projected to reach 288,500 vehicles. The new highway infrastructure had multiple designers, including MnDOT staff, consultants and the city of Minneapolis. “Staging was a major challenge to balance the impacts to road users and neighborhoods,” said Aaron Tag, west area engineer of MnDOT. “Being a dense urban area, there are many utilities along the corridor — both public and private. Coordination of the relocation of those utilities is a major component of the project. With the work taking place in a dense urban area with limited right-of-way, keeping traffic moving while maintaining safety for the road users, workers and neighbors is always a challenge. A lot of attention is being focused on signage through the construction area and having a good work area perimeter to keep out the general public. “Balancing the staging to limit the duration of the project and the impact to adjacent neighborhoods and the traveling public is something that was given a lot of thought during the development,” he added. 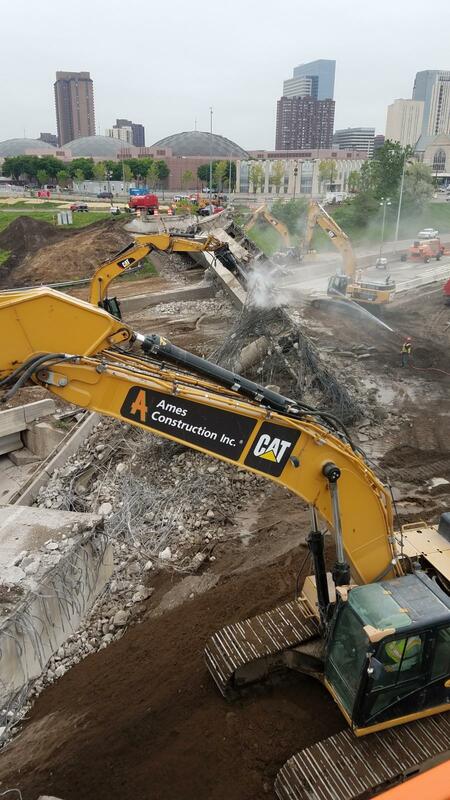 MnDOT is using a variety of tools to inform the public on lane, bridge and ramp closures to minimize the impact on local traffic that occur as the work schedule presses forward. Some of the closures are permanent. The work also impacts Metro Transit bus routes, including the Orange Line, and public transit users are being asked to visit the Metro Transit Orange Line Project web site. MnDOT also is helping local businesses affected by the construction with programs, guides and web sites with information to retain customers and provide routes for employees to get to work. MnDOT has been hosting public meetings with citizens, the business community and community organizations since 2016, and many more will be held in the future. “The public recognizes the size and significance of this project and is well engaged. People are thinking early about alternate routes and alternate forms of transportation.” said Aeikens. The project has been split into five stages. 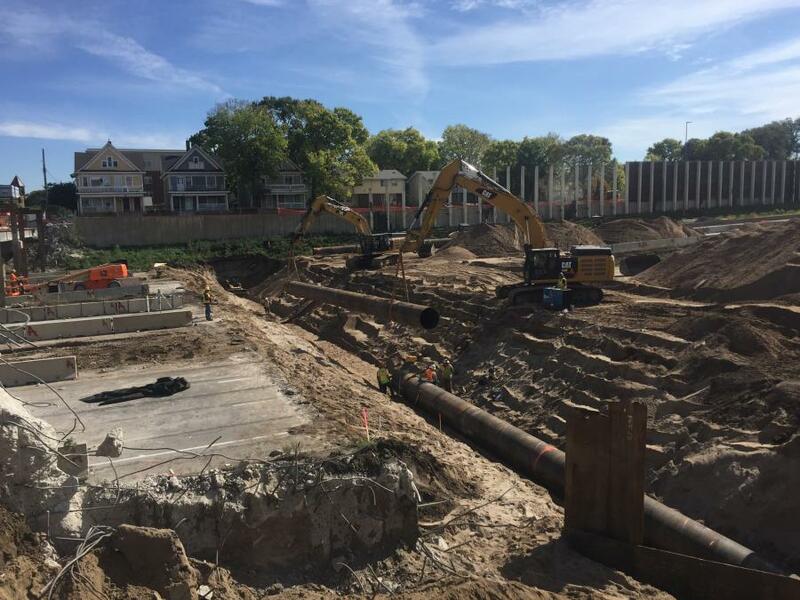 “To date we've completed underground utilities — sanitary sewer, water mains, a storm sewer, cast-in-place retaining walls and the removal and replacement of the Franklin Avenue Bridge,” said Jason Block, the J.V. project manager. “It's an urban reconstruction from right-of-way to right-of-way including: retaining walls, bridges, roadway surface, utilities, drainage systems and the building of a new bus transit station. Work-wise, each partner generally has specific work sites to cover, with Ames completing roadway grading, underground utilities, bridge and retaining walls; Lunda focusing on bridge and retaining wall work; and Shafer completing roadway removals, roadway aggregates, concrete paving, concrete barrier, concrete curb, gutter and sidewalk work. While each partner has its subcontractors, some subcontractors have been hired by the J.V. to complete specific items. Each partner uses and looks after its own equipment, but resources are shared at times to help move the project forward. The same three partners were part of a J.V. back in 2007 that reconstructed 35W and TH62, which is adjacent to the current project. The work season generally runs from early April to late November, although some activities can continue throughout the winter such as bridge and retaining wall and underground utility work. Many private utilities in the work area need to be relocated or protected, which has the J.V. engaged in non-stop coordination. The J.V. is sharing a project field office with MnDOT officials, which helps to resolve issues rapidly. “There is no barrier — we can talk to one another about miscellaneous items and resolve things very quickly,” said Block. To coordinate the activities of the J.V. partners, weekly schedule management meetings are held to ensure that the partners and subcontractors are all on the same page. MnDOT, the city of Minneapolis and other stakeholder also are kept apprised of schedule issues. The work is essentially taking place 24/7, with significant weekend work where complete sections of road on both sides are closed to allow for deep utility crossing, existing bridge removal and traffic lane switches. The work is proceeding well, with traffic being a constant issue. The J.V. also has suggested changes to the design that will reduce construction time and save money. “We work with a local engineering firm to be innovative in redesigning traffic control and staging to save time and money,” said Block. There are close to 150 construction workers on site on peak days right now, which will increase to close to 200 in the future. The major subcontractors include: All Phase Contracting for removal and construction of noise walls; Sheehy for building of the new transit station; Alliant Engineering for environmental and traffic control design; Killmer Electric for TMS and electrical items; Standard Contracting for environmental services; E&J Rebar for installation of rebar and structural steel; Hanson Custom Crushing for crushing of existing concrete and bituminous materials; ECON Placer for concrete pumping; Warning Lites for stripping and traffic control; Hardrives for bituminous paving; H&R Const Co. for signs and guardrail; Rainbow for concrete surface repair and concrete surface painting; Zan & Associates for public information and communications; and Castle Rock Contracting and Tree Services for clearing and grubbing. Crews anticipate removing 460,000 sq. yd. of existing roadway surface, 13 existing bridges and multiple retaining walls. 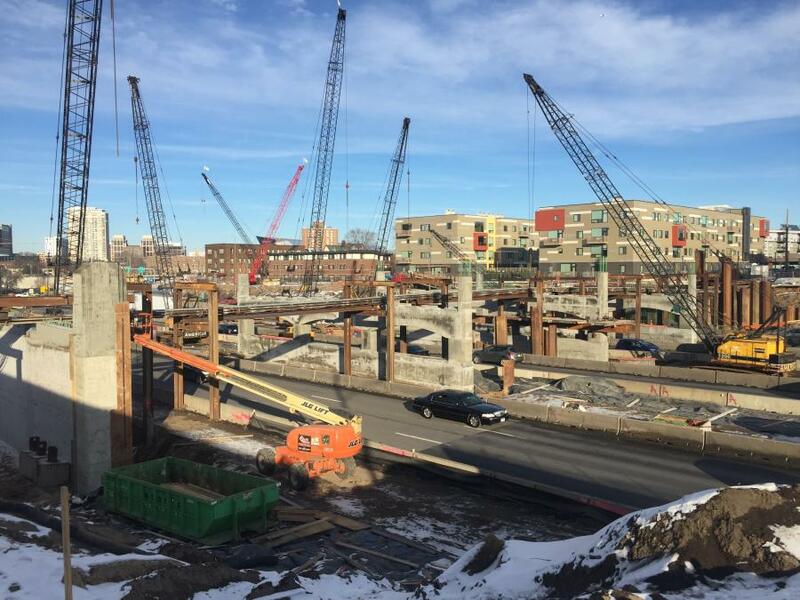 “We're recycling all of our existing bituminous and concrete roadway materials, along with the existing bridge demolition materials,” said Block. When all is done, new materials will total 60,000 cu. yd. of structural concrete; 85,000 cu. yd. of aggregate base; 330,000 sq. yd. of concrete pavement; and 250,000 sq. ft. of wood noise barrier. 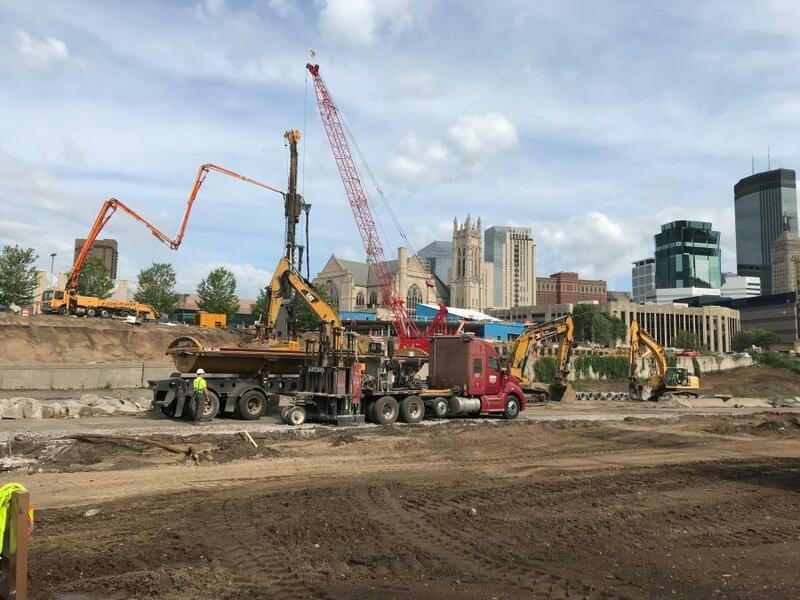 The project is utilizing: Terex, Manitowoc and Grove cranes; Cat, John Deere, Komatsu and Link-Belt excavators; Cat and John Deere dozers; Cat, Volvo and Komatsu loaders; Cat and LeeBoy pavers; Cat and Dynapac rollers; and Volvo and Cat articulated off-road trucks. All three J.V. partners have many dump and flatbed trucks on the job, as wells as side and belly dumps. 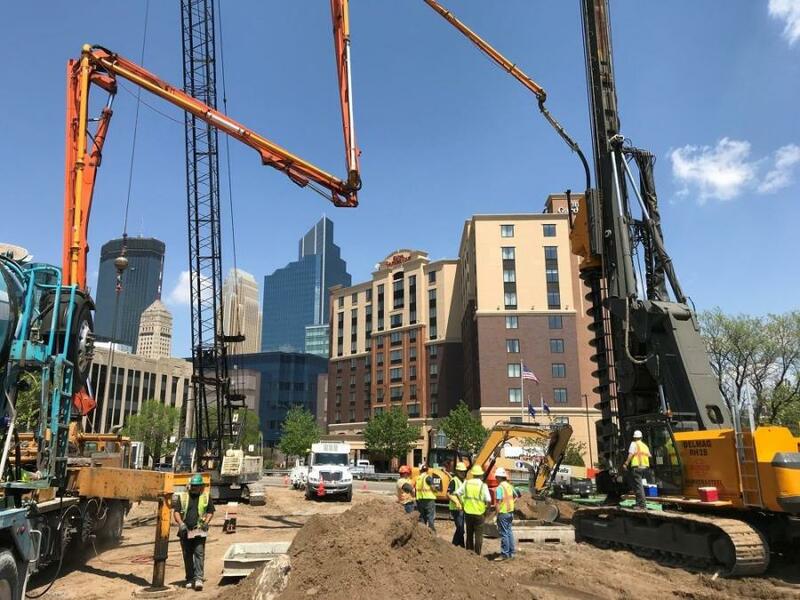 Ames purchases equipment from dealerships such as Ziegler Cat, with several locations in Minnesota, and cranes from Hayden-Murphy in Minneapolis. The company rents equipment from RMS Rentals in Savage, United Rentals and Hammer & Steel in Lakeville. Block is fully aware of the challenges facing the project, but has no doubt that all benchmarks will be met. The JV has a project specific Safety, EEO and Environmental Orientation that is required for all workers prior to being on site and holds safety meetings daily. “We provide positive encouragement and keep an open dialogue with our workers” said Block, “and the understanding that safety is number one and that they should take pride in what we are building with a team atmosphere.